Once you have chosen your images, click “Next”. 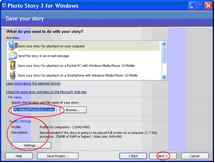 On the the screen which follows, you can change effects, add captions, and tiles to your story. Click next when you are done. On this screen, you can narrate your pictures, customise motion (i.e. 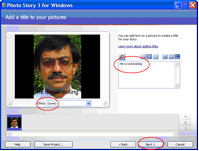 change slide transition times) and preview your story. 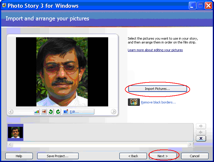 Most laptops and desktops have some recording option – so narrating photos should easy to do. As previously click next when you are done. On this screen you can add music. A good option here could to be record songs sung by student or music created by them as the background. You can also choose on board music (i.e. music which is already embedded with the program). 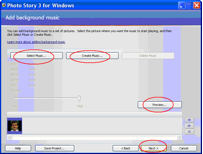 To do this click on the create music option. The next screen finishes your production by saving it as a .wmv file. On this screen you can make adjustments to the size of the .wmv file. 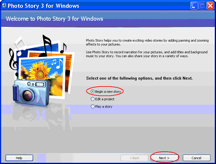 Once completed, the file can be copied onto a DVD – it will then play on any DVD player.